While persistent rumors have indicated Peugeot becoming the first factory team to campaign a hybrid in the Intercontinental Le Mans Cup LMP1 competition next year, one of the sport’s privateers has already firmed up plans to utilize the cutting-edge alternative technology for 2011. Last weekend in Zhuhai, Hope Polevision Racing took the wraps off its new gasoline-electric hybrid project, which will make its debut at the Twelve Hours of Sebring in March. The Swiss-based team, co-owned by Jean-Marie Brulhart and Benoit Morand, will enter an ORECA 01 equipped with a flywheel-based hybrid system from Flybrid, the makers of Honda F1’s KERS system. 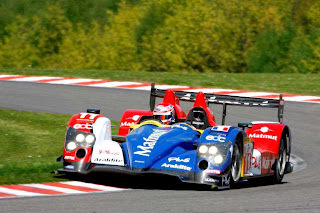 “It’s a huge challenge that awaits us as we’ll be the first private team to race an LMP1 hybrid in 2011,” Morand said. “We’ve chosen competent, experienced people in each of the sectors of the car. Our number one aim is reliability, which is of primordial importance. No strangers to the world of European sportscar racing, Hope PoleVision has been a regular competitor in the Formula Le Mans category, which was integrated into the Le Mans Series this year. The move up to the LMP1 ranks comes as part of its four-year plan, with the ultimate goal being outright victory at Le Mans by 2013. The team has entrusted veteran sportscar outfit Lehmann as the tuner of the two-liter turbo engine. Further details of the power plant, including its branding, is expected at a later date. Unlike Corsa Motorsports’ battery-based KERS system seen in the American Le Mans Seres in 2008, Hope PoleVision’s Flybrid system is of a flywheel construction, similar to that used in Porsche’s 911 GT3 R Hybrid. The big difference, though, comes with the application of stored energy, as ACO regulations state it must be controlled by the gas pedal instead of a manual boost button that's outfitted on the Porsche. Flybrid’s system is called CFT, which stands for clutch flywheel transmission. While the team had looked at the various hybrid possibilities allowed within the revised LMP1 rules for 2011, technical director Andrew Sayer says a flywheel-based system made the most sense. The team expects its Oreca 01, updated to 2011 LMP1-spec, to be out testing by February, in advance of a full ILMC season. A two-car Formula Le Mans program for the Le Mans Series was also confirmed, which should make Hope PoleVision one of the busiest privateers in sportscar competition next year.